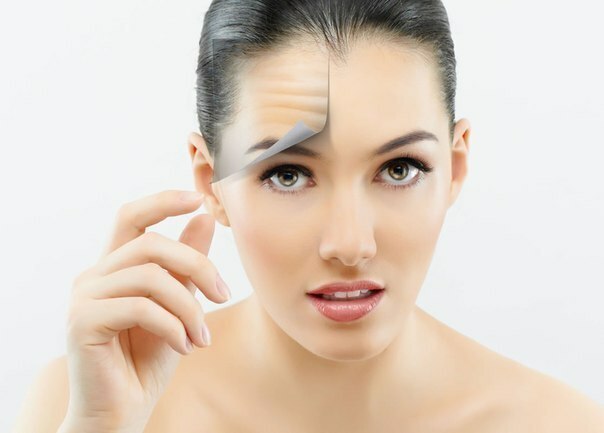 Fine lines and wrinkles on forehead are considered the early signs of aging. As we age our skin start losing its natural moisture and elasticity and create fine line and wrinkles. Direct exposure to UV Sun rays without proper skin care is also one of the main reason for early fine lines and wrinkles. Smoking, stress and wrong use of cheap cosmetics are also some other reasons for forehead fine lines, wrinkles, and deep furrows. Beauty Conscious women spend a lot of money on expensive commercial products to get rid off forehead lines and wrinkles but often don't get the desired results. However, here we have some best natural home remedies to get back your youthful and wrinkle-free skin. Use them on regular basis and see the difference within few days. Aloe vera gel has been shown excellent results in removing forehead wrinkles. Aloe vera gel deeply moisturize the skin and and help a lot to remove forehead wrinkles. Alternatively take some aloe vera gel and mix with small quantity of egg white. Apply this paste on your forehead and wash off with lukewarm water after 15 minutes. Take equal quantities of olive and coconut oil and mix them well. Apply this mixture on your forehead and massage for 5-7 minutes. Leave on over night and next morning rinse off with fresh water. This home remedy is very effective to prevent and cure forehead lines and wrinkles. Lemon juice is one of the best home remedies for forehead wrinkles and dark skin on forehead. For reducing wrinkles on face and dry skin on forehead, just mix half teaspoon of lemon juice with equal amount of olive oil and apply this mixture on the forehead. Your forehead skin will get fair gradually and the frown lines and furrow lines will begin to disappear after using this natural remedy. Apply castor oil to the frown lines and massage it gently for getting rid of forehead lines and wrinkles naturally. Regular application will show you an amazing result within few days. Take some small pieces of raw papaya and banana and mash them to make a thick paste. Apply this paste for 15-20 minutes on the forehead area to get rid of forehead wrinkles. Make a thick paste of equal quantities of mashed papaya and pineapple. Apply this paste on your forehead and leave on for about 15-20 minutes and then wash off to reduce wrinkles on forehead. Application of cucumber juice helps a lot to remove forehead wrinkles. Extract the juice of cucumber and apply it to the wrinkles on your forehead with the help of a cotton ball. Leave for 15-20 minutes and then rinse off after 20 minutes. Take 1 teaspoon of milk cream and mix few drops of lemon juice. Apply this paste of your forehead and after 15-20 minutes wash off with fresh water. This natural home remedy is very effective to remove forehead wrinkles. Take 1 teaspoon of turmeric powder and mix with 1 tablespoon of sugarcane juice. Paste of turmeric mixed with juice of sugarcane helps a lot to make your skin wrinkle free. This home remedy has a wonderful power to slow down and reverse skin aging process. Avocado paste also help a lot to get wrinkle free and tight skin. Take one teaspoon of avocado pulp and add some lemon juice to make a thick paste. Apply this paste on your forehead and leave for 15-20 minutes and then rinse off with fresh water. Regular application will show you excellent result within few days. Take 1 teaspoon of honey and mix with some egg white and apply this paste on your forehead to cure the problem of forehead fine lines and wrinkles. Rinse off after 15-20 minutes. Rose water is a natural skin toner and help a lot to get tight and wrinkle free skin. Apply some rose water to cotton ball and gently apply it to the wrinkles. Repeat this simple procedure on daily basis until you get wrinkles free skin. (i) Avoid direct exposure to harmful UV Sun rays, Before going out don't forget to apply good sunscreen contain SPF. (ii) Avoid Stress because stress is another cause of the forehead wrinkles as we give multiple facial expressions to show our situation, which in return create wrinkles. Try to enjoy tension free life in order to prevent and remove the ugly wrinkles on your forehead. (iii)Forehead wrinkles become more pronounced when you do not hydrate your skin adequately. Dry skin is most prone to wrinkles. Try to drink 8-10 glasses of water daily for fresh, firm and wrinkle free skin. (iv) Avoid smoking and alcohol to prevent early fine line and wrinkles. (v)An Adequate sleep of 6-8 hours is also essential to prevent forehead wrinkles.